27.11 The crisis phase begins with either or both Axis major powers announcing an aggression. 27.12 Each Axis major power is limited to one aggression per turn. 27.13 If both Axis major powers announced aggressions, they are resolved in tandem, so that any Axis and Allied secret support events are revealed at the same time. Italy may not conduct any other aggressions until it has conquered Ethiopia. Italy may not conduct aggression against Greece or Yugoslavia unless it controls Albania. Italy may not conduct an aggression in a turn in which it intervened in a civil war other than against the minor country in which it has intervened. Italy may not conduct an aggression in a turn in which it intervened in a civil war or is engaged in a war with a minor country. This last restriction prohibits Italy from trying to conquer Greece and Yugoslavia at the same time. 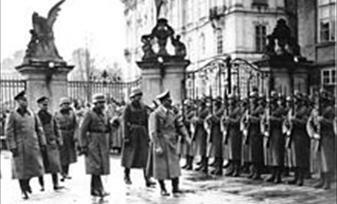 Germany may not conduct any other aggressions until it has remilitarized the Rhineland. Nazi-Soviet Pact: Axis aggression against minor countries which contain Russian flags is prohibited if the Nazi-Soviet Pact is in effect. D. Czechoslovakia (Bohemia, Moravia and Slovakia). E. Poland (Danzig and the Polish Corridor). B. Oppose the aggression and threaten war against the Axis aggressor. A. AGGRESSION SUCCEEDS: The aggression succeeds and the Axis aggression is resolved (29, 30). B. NO PENALTY: There is no penalty to the Allies for acquiescing in an aggression, other than the consequences of the aggression itself. 27.53 THREAT OF WAR: If the Allies threaten war, the Axis aggressor must decide what to do once the resistance level of the target minor country is determined (28). A. SUPPORT: The Axis aggressor’s support level is reduced by -1, and the support level of each Allied major power is increased by +1. B. ACTIVITY COUNTERS: The Axis aggressor may not use one of its generic 1 activity counters; each Allied major power may use an additional generic 1 activity counter. An Axis shipbuilding 1 activity counter may not be selected. The simplest way to implement this rule is for one of the Allied major powers to take one of the Axis aggressor’s 1 activity counters to use in the next turn. The Allied player will then remember that he has an additional 1 activity counter – and the Axis player won’t inadvertently use the prohibited activity counter. The same approach should be used when rules 27.72B and 27.82B apply. Has its starting BRP total reduced by 3 BRPs. Has its unit construction limit reduced by 3 BRPs. Starting BRP totals increased by 3 BRPs. Unit construction limits increased by 3 BRPs. 27.63 CONTINUED AGGRESSION: If the Axis aggressor chooses to continue the aggression, the Allies must decide whether to persist in their opposition to the aggression. A. SUPPORT: The Axis aggressor’s support level is increased by +2, and the support level of each Allied major power is reduced by -2. B. ACTIVITY COUNTERS: The Axis aggressor may use an additional 2 activity counter; neither Allied major power may use one of its 2 activity counters. Starting BRP total increased by 6 BRPs. Unit construction limit increased by 6 BRPs. Has its starting BRP total reduced by 6 BRPs. Has its unit construction limit reduced by 6 BRPs. 27.73 ALLIED ULTIMATUM: If one or more Allied major powers met the declaration of war threshold (32) and is able to declare war, the Allies may issue an ultimatum, giving the Axis aggressor a final chance to avoid war. B. Attack the target of the aggression and trigger a general war that ends the game. A. SUPPORT: The Axis aggressor’s support level is reduced by -3, and the support level of each Allied major power is increased by +3. B. ACTIVITY COUNTERS: The Axis aggressor may not use one of its 3 (Germany) or 2 (Italy) activity counters; each Allied major power may use an additional 3 (Britain) or 2 (France) activity counter. Has its starting BRP total reduced by 9 BRPs. Has its unit construction limit reduced by 9 BRPs. Starting BRP total increased by 9 BRPs. Unit construction limit increased by 9 BRPs. 27.83 WAR: If the Axis aggressor does not back down, war breaks out between the Allies and the Axis aggressor (EXCEPTION: If Italy conducts an aggression and German declares pre-emptive war on the Allies at the end of the crisis phase (32.8), the Allies may, without penalty, withdraw their ultimatum and acquiesce in the Italian aggression and remain at peace with Italy). After the outbreak of war, research is completed (33.2), the game ends. If the game is continued into A World at War, the Axis aggressor is committed to attacking the minor country that was the target of the aggression.